LG is offering consumers more ways to control your home and enjoy the benefits of a connected home experience across a range of their home appliances. LG Electronics USA announced that 87 of their Wi-Fi connected home appliances, such as their washing machines and dryers, dishwashers, vacuums, refrigerators, ovens, air purifiers are now compatible with Google Assistant on Google Home and supported Android and iOS smartphones. If you are a LG smart appliance owners you can now use Google Assistant to help you around the house. For example, you can use simple voice commands from anywhere within range of the Assistant on Google Home (or on their smartphone) to check the time remaining during wash cycles on your washing machine, tell their LG refrigerator to make more ice, turn off your range after cooking, adjust thermostat settings on your LG air conditioner, and even check the air quality level in your home using the LG air purifier. The Assistant on Google Home can also distinguish one voice from another, so it can be personal to just you. Setup is simple and convenient with the free downloadable LG SmartThinQ app, available for Android or iOS. 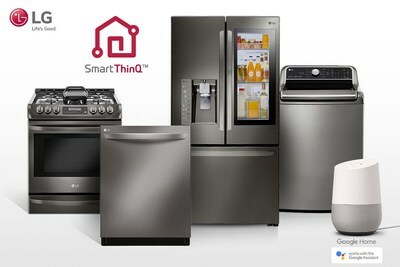 With just one app, users can control the entire line-up of LG smart appliances. Whether it's preheating the oven on the way home from work or checking the remaining laundry time while at the gym, LG makes managing smart appliances easy. LG SmartThinQ learns about your usage patterns and helps predict your needs. The more you use these smart appliances, the smarter the appliances get. By using adaptive technology to interpret usage habits and data, LG smart appliance will know when to alert you it's time to order filter refills in their refrigerator or air purifier, and it can troubleshoot lint build-up in their dryer – all through the LG SmartThinQ app.